The only mistake is getting caught. Oh good heavens! You’ve got the fawning monsters, and now the critical monsters….. I feel like Sybil! I’m sorry Bella, they really are unpredictable, aren’t they? “You stink” is my fave. Though the tail on “I’m telling Mom”‘s romper is marvellous. P.S. I love the word “romper.” (Go on and say “I hardly knower” for old time’s sake). 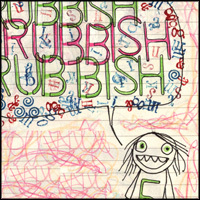 Don’t you wish you had “Rubbish”‘s pants? They’re very circus sideshow. Think they sell those at Sears? God, I miss you! Hahaha…looks like they all watched a bad Hollywood action flick.